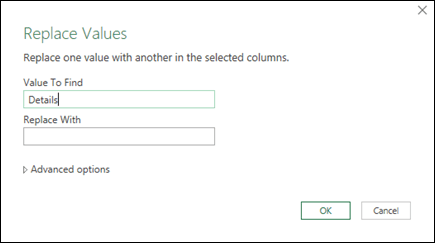 In this tutorial, you'll use Excel's Power Query experience to create a query that imports data from a web page. As part of this process, you'll navigate across tables available on a web page, and apply data transformation steps to display just the data you want to see. Power Query records all of your steps, and they will be repeated whenever you refresh your data. Excel 2016: Click the Data tab, and then New Query > From Other Sources > From Web. If you don't see the New Query button, click Data > From Web. Excel 2010-2013: Click the Power Query tab, then From Web. If you don't see the Power Query tab, make sure you have downloaded and installed the Power Query add-in. In the From Web dialog box, paste the Wikipedia URL (http://en.wikipedia.org/wiki/UEFA_European_Football_Championship) in the URL text box. After establishing a connection to the web page, you see a list of tables available on this Wikipedia page in the Navigator pane. You can click on each table to see a quick preview displayed in the pane on the right. Double-click the Results table, and the Query Editor will open with the tournament data. Now that you have the table open in the Query Editor, you can clean and shape the data so that it fits your needs. In this step, you'll reshape the data by removing all columns except Year and Final Winners. 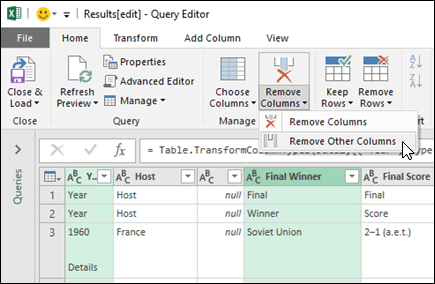 In the Query Preview grid, use Ctrl+Click to select the Year and Final Winners columns. Click Remove Columns > Remove Other Columns. In this step, you'll clean the data by replacing values and filtering the data. In the Query Editor, click Replace Values. In the Replace Values dialog box, type "Details" in the Value to Find text box and leave the Replace With text box empty. Now, you'll filter the Year column to display rows that do not contain “Year”. Click the filter drop down arrow on the Year column. In the Filter drop-down, uncheck Year. Now it's time to name the query you've been creating. 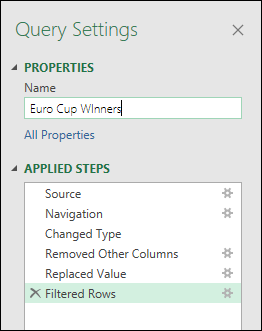 In the Query Settings pane, in the Name text box, enter Euro Cup Winners. If you click the All Properties link, you can also enter a query description in the Description text box. 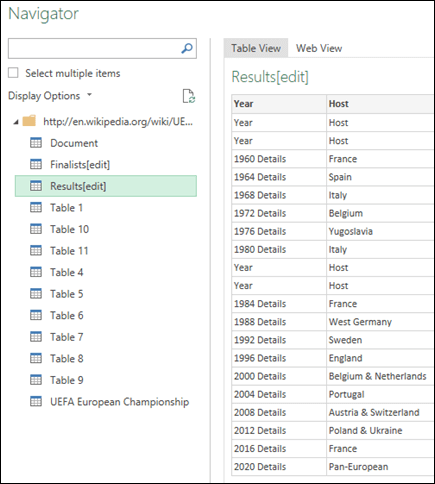 Finally, you can now load the Euro Cup Winners query to a worksheet. In the upper-left corner, click Close & Load. Power Query will return the query results to a worksheet. If you need to update the data at a later time, right-click anywhere in the data range and then click Refresh. Any new information from the web page will be automatically updated. Click anywhere within the data, and on the Query tab, click Edit. On the right, notice the list of Applied Steps. As you performed query activities, query steps were created. Each query step has a corresponding formula written in the "M" language. You can see the M code in its entirety by clicking on the Advanced Editor option in the Power Query ribbon. For more information about the Power Query formula language, see Learn about Power Query formulas, and Power Query M Reference..